The Dynamo (crank power) radio is perfect for listening to music, sporting events or keeping informed during emergencies. 1 minute of crankingprovides 10 minutes of radio use. Compact enough to take camping, hiking and fishing or just use it around the house. 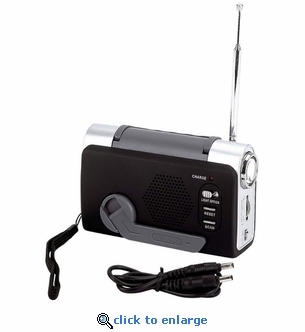 It features a telescoping antenna to increase reception and a handy carrying strap.